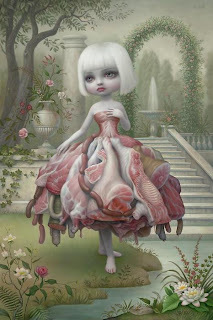 From the art movement known as POP SURREALISM. 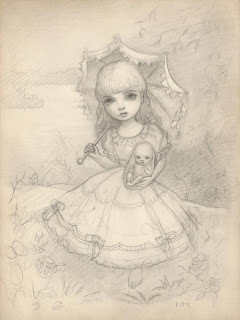 His works emit the creepy aura, but somehow, that is what make it fascinating. 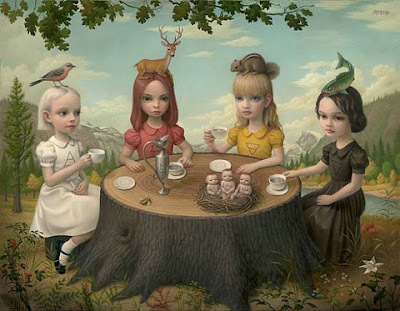 At first, the paintings seem normal and even have a dreamlike quality to it, it is like Alice in Wonderland. The human form is portrayed in such a way that it looks like a character appearing out of a fantasy book. The colours used emphasised its dreamlike quality as soft hues are present, but the whole scene is so painted with so much skill and precision, such that the scene looks real. A sense of boldness is actually present, the solid feeling that the scene captures is just breath-taking. 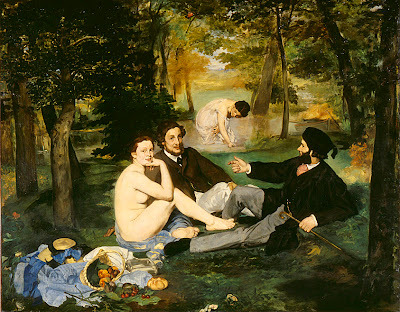 I wonder if she actually got the idea from this painting... That is like bringing surrealism to reality. It just made me realise that Lady Gaga's meat dress is like a performance art...quite bizzare but it all depends on whether we can appreciate the meat dress or not. Well, his works all have the same style - there is a certain darkness in his seemingly light-hearted paintings. The distortion and mutation of forms are present in all of his paintings. 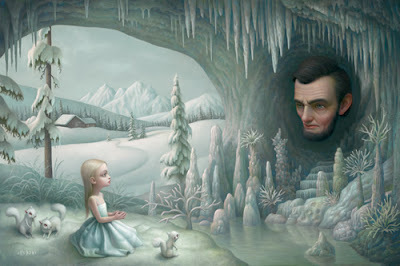 His paintings also portray the corruption of childlike innocence. For example, the painting of the "teletubbies" shows mutation of the original teletubbies' forms. 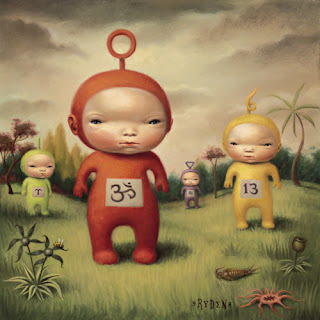 In his painting, teletubbies are portrayed as small eyed aliens, disrupting our notion of something that is associated to our childhood. It is like saying: "THE TELETUBBIES ARE EVIL!" There is also a use of religious symbols in the teletubbies work, which may seem controversial. Well, controversial art is so common nowadays... He twists our childhood memories in a way, distorting them and portraying them as something evil. I guess that this is something like the metamorphosis of the human form. Or it can be metamorphosis of childhood fantasies into something that is dark and morbid. Cool. (: The morphing of innocence into corruption and evilness. This is the distorted Snow White. Not quite the snow white "who is the fairest of them all". Does it remind you of these? Well, it looks like the influence of Manet is present in Ryden's works (in terms of composition). Visit www.markryden.com to view the rest of his works! (: Morbid yet fascinating.